Team Fortress 2 on virtual reality is a real thing; you can try it out if you happen to have an Oculus Rift developer kit. Since playing games on virtual reality will be new for most of us, players will likely have to undergo an adjustment period in order to avoid a possibly disorienting experience. Those of us that don't gain "virtual reality legs" might experience motion sickness, for example. Some of us will have an easier time adjusting than others, though. 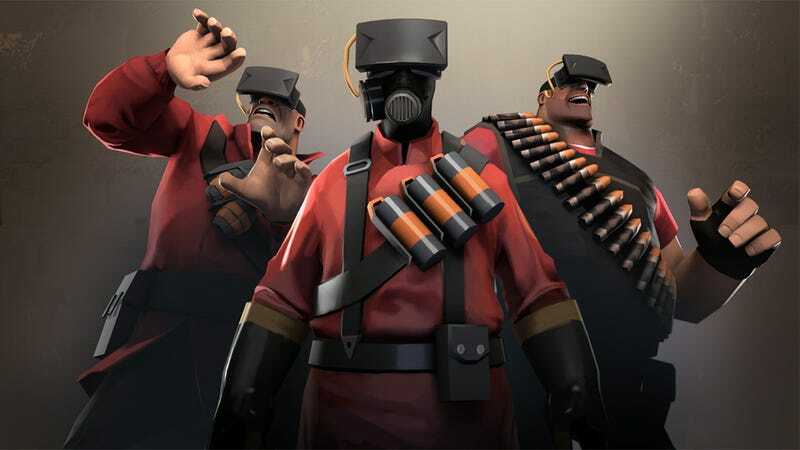 Last week during the Game Developers Conference, Valve gave a couple of talks on Team Fortress 2 and virtual reality (and you can view some of the slides from one of the presentations here). All player's experiences with the new technology will not be the same; some players will be better than others. Specifically, new players might be better than seasoned players. "The people who are better...I feel like their skill is reduced more by VR, the people who were new at shooters, new at TF, actually seem like they were doing better," Valve explained. The thing is, new players won't have hard-wired expectations of how to do basic tasks in the game, which means they can adjust more easily to what virtual reality requires of you. It might be a better idea to do something with your head (like turn) than to try to use your mouse and keyboard to do it. While hopefully it's only a matter of time before we can work back up to our respective skill levels in the game, if you get destroyed a whole lot when playing Team Fortress 2 on virtual reality, don't be surprised if your opponent tells you they're completely new to Team Fortress. If it's any consolation, it seems that all players might have a bit of trouble adjusting to climbing stairs and ramps according to Valve's talk.